It may have been the hottest Bank Holiday on record. But we didn’t let the gorgeous weather stop us from visiting the Grand Designs Live show in London on Monday. Instead, our team of interiors editors decided to follow in the footsteps of design guru and TV presenter Kevin McCloud. After all, it was Kevin who officially opened the show on Saturday! The downstairs cloakroom is fast becoming the space in which to experiment with design. After all, it tends to be the smallest room in your home. So why not balance a bold design and express your individuality? We thought interior designer Maria Gratsova of Bright Designs captured the essence of this space perfectly (see image left). 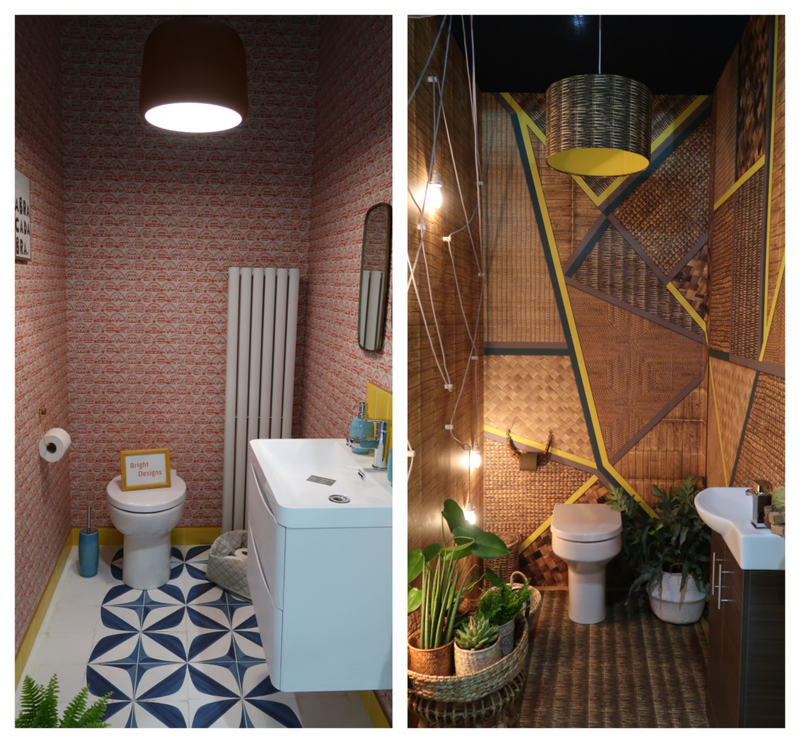 Designed for the Lavatory Project, Maria brought her room-set to life with a mix of vibrant colours, patterns and textures with functionality also key. We also enjoyed the downstairs cloakroom designed by Studio 26. The weave wallpaper looked spectacular for an element of bringing the outside in with a tropical vibe. With a new concept website launching soon, look out for their site www.studio26.online when it goes live. If you’re planning a kitchen redesign, don’t let bespoke painted and contemporary Italian kitchens specialist Ray Munn Kitchens pass you by. Their modern, handmade Zetasei kitchen from the Arredo 3 collection has been designed to cater for every inch of space. With an extremely low plinth, you can instantly benefit from more room inside your base cabinets. Consequently, this creates an optical illusion that the kitchen is suspended for a more modern touch. 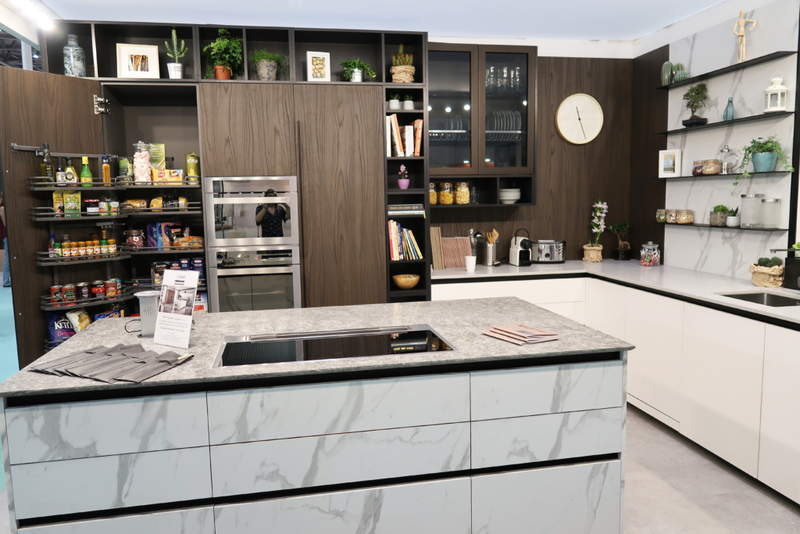 We loved two of their new finishes, Fenix and Laminato Legno, which graced their stand at this year’s Grand Designs Live show. The price point is reasonable too for those who are looking for affordable, stylish sophistication. 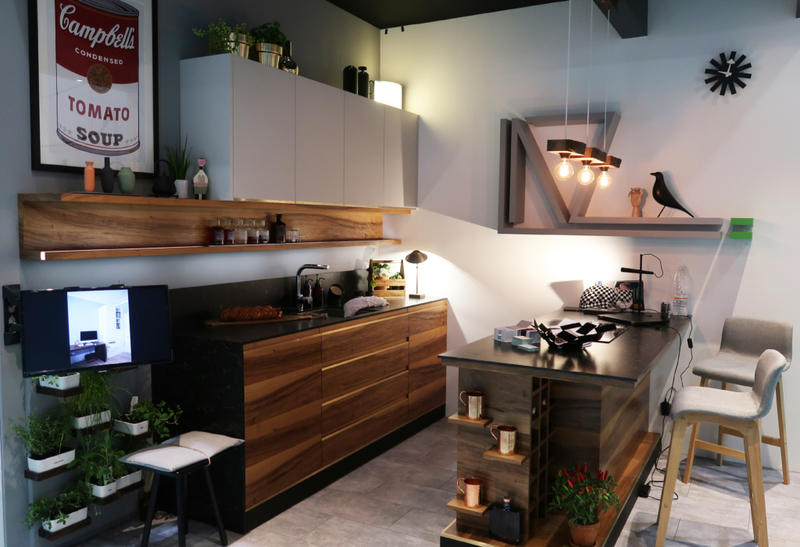 Another innovative kitchen design, which stopped us in our tracks, came from Lazfurniture. We adore European walnut and this furniture finish worked beautifully with contrasting modern neutral wall units. However, these luxury, bespoke cabinets featured some exquisite finishing touches too, including the beautiful brass trim. We heard how master craftsman Laszlo Kincses works on a wide variety of projects for the home from living room to bedroom furniture. Service starts from the design through to the fit and the furniture is built in their East London studio for convenience. For those who might be looking for an accessible bathroom, Motionspot is a must and can be found at this year’s Grand Designs Live show. Perfect for those who want to achieve independence and wellbeing, their creative designs for the bathroom look ultra chic and function beautifully, too. When we spoke to the co-founder, Ed Warner, the story behind this brand illustrates why their bathrooms are so exceptional. He set up the business with his friend James Taylor, after James was paralysed in a diving accident in 2005. With James’ first accessible bathroom resembling a room in a care facility, the pair got to work. Now, they produce beautiful, inclusively designed bathrooms for people of all mobility levels. You can choose from shower floors and grates to fixed and removable support bars and rails. Have you ever seen bi-fold doors in a shower room? Ed explained how a level access walk-in shower can still benefit from a screen to help keep the water contained. We were wowed by the glass panels’ ability to fold flush against the wall to help increase circulation space, too. 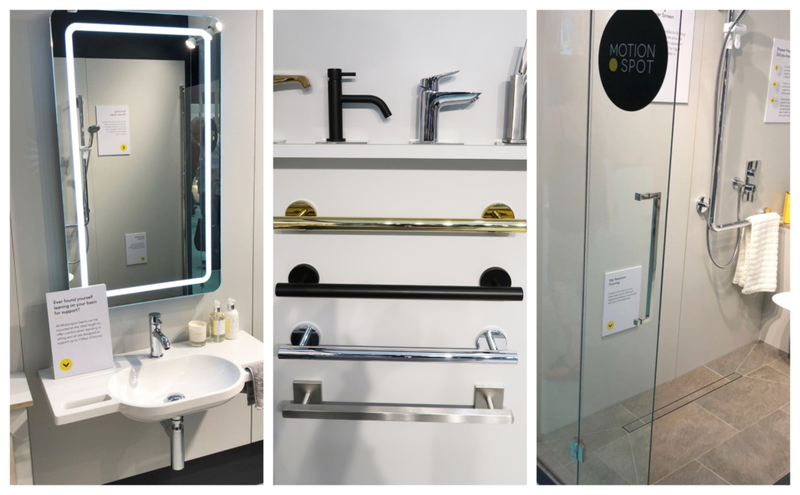 Motionspot’s removable grab rails also look good featuring the latest on-trend finishes in antique gold, matt black and brushed antique stainless steel. If you want to feel like a ‘superstar’, then this is the chair for you. As soon as we saw it at the Grand Designs Live show, we tried this high, curved wing back chair with chrome swivel base for size. And… guess what? It fitted us perfectly! The Superstar is a statement chair featuring an eye-catching design, which joined an impressive collection of furniture by House Of Interiors. They design everything from scratch and it can be customised, making this a great choice if individuality in the home is your thing. They even offer an interior design service and you can visit their Hertfordshire showroom for more inspiration. We couldn’t possibly miss the stunning room-sets at this year’s show and this gorgeous bedroom by Oliver Thomas Interiors led them all. 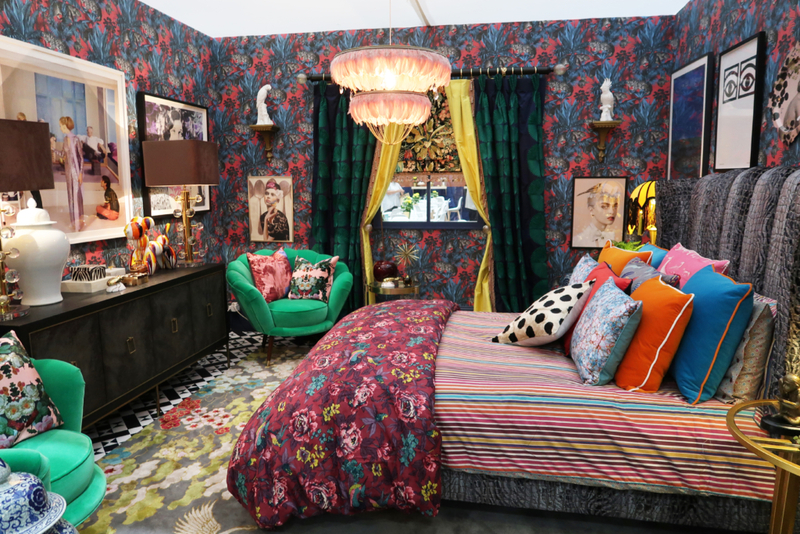 With a nod to whimsical design, we loved the heady mix of pattern and vivid colour coming together to create the ultimate boudoir. Oliver was a finalist on season four of the BBC’s Great Interior Design Challenge. He describes his technique as a blend of classic, period features with contemporary styling. Definitely one to watch! Looking for lighting, which is not only unique but provides a solution for sustainable living? Then Collectiviste is the brand for you. This UK-based company works with talented craftsmen and women in Papa Agung in the grounds of an old temple on the side of Kintamani volcano. Their stunning Penyu collection is handmade from up-cycled oyster shells from fishermen on the island of Madura and recycled glass. 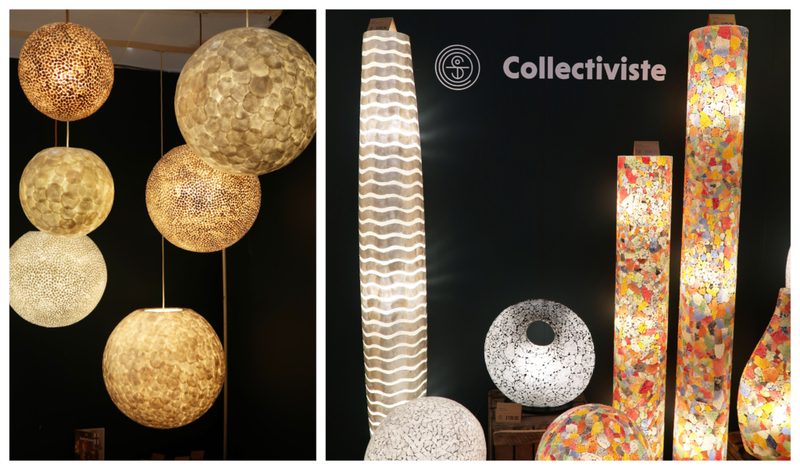 In fact, they create every light and lamp using natural, sustainable materials and distributed from their Norfolk HQ. They make the actual shades with fibreglass and each piece has been designed to make a statement in the home. Distinctive wall and floor tiles stood out from the crowd on the Innova Tiles stand at the Grand Designs Live show. 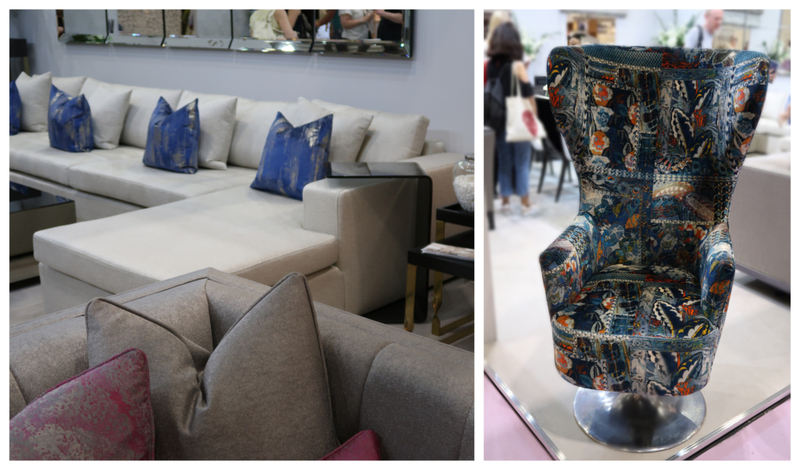 Their Italian collections featured a variety of finishes, textures and sizes so something to suit everyone. Their large format (400mm by 120mm) Honeycomb tile was just one of the styles, which attracted our attention, with a raised texture for the ultimate luxury finish. Vintage décor is a firm favourite with our team. So, when we saw this collection from The Old Radiator Company, we couldn’t resist taking a snapshot. 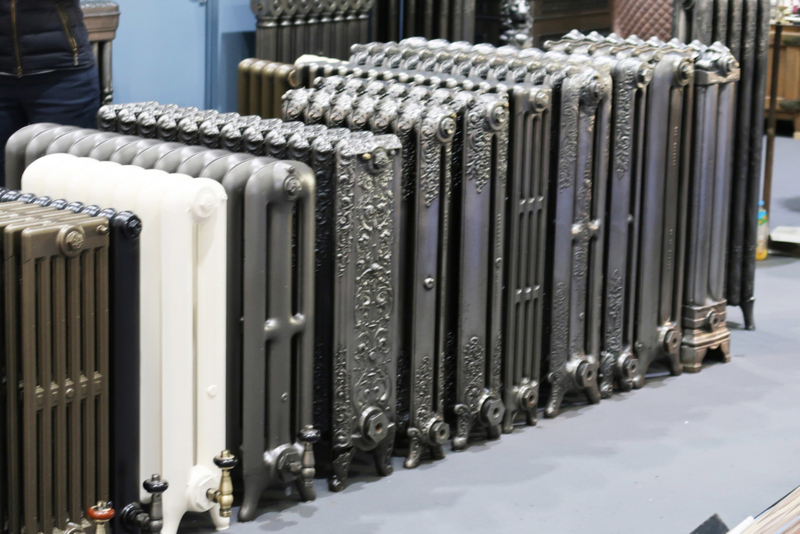 You’ll be spoilt for choice with more than 4,000 old cast iron radiators in their 3,000sq ft showroom.